This particular seasoning blend is our first of MANY to come that we consider to be a "Gourmet" blend!! First, we started with the main ingredient which is Organic Manchurian Apricot wood smoked "Reaper" peppers! The second ingredient is dried "Reaper". Next we use Organic Macintosh Apple wood to SLOW SMOKE some Trinidad Scorpion Chocolate peppers! 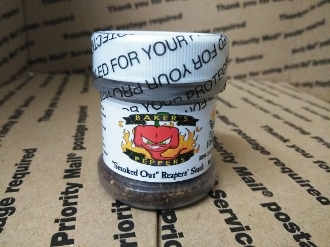 This particular blend is REALLY for the "smoked/smoky" type of flavor person out there! Absolutely TOP OF THE LINE pepper powder blend right here folks! You will not find THIS blend ANYWHERE else on the PLANET!! We finish it off with some Hickory wood smoked Butch T Reaper Scorpion peppers and bottle it up!!! 100% GOURMET SEASONING BLEND!! Smoked to PERFECTION!! ****Purchase/Consume at your own risk!